Tools of the Stone Age were made from many materials such as wood, bone, shell, and antlers, and helped lead in the development of human civilization. Tools of the Stone Age research paper due and don’t know how to start it? How about like this? The Neolithic period, also referred to as The New Stone Age, began around 8500 BCE with the rise of farming and ending with the Iron Age and metal tools. There is a fine line between the Upper Paleolithic and beginning Neolithic period. As seen in the Euphrates River Abu Hureyra excavation, early Neolithic people evolved from a settlement of hunter-gatherers (similar to the Upper Paleolithic people) into a village of early farmers. Later, the Neolithic life became more advanced as they learned to domesticate animals, produce pottery, and builders of mud-brick housing. Artifacts from this period show the ability to think and transform social conduct, unlike the Paleolithic period. Experts believe that differently marked vessels were used as a means of drawing distinctions between different activities, different locations, and different classes of person. This level of sophistication was much improved from the Paleolithic era. At best, the Paleolithic hunter-gatherers lived in caves and temporary shelter, surviving on available game and wild vegetation. Throughout the Stone Age, tools took on a number of forms and purposes. 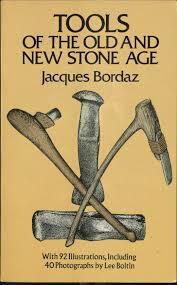 Stone tools were made from a variety of stones, depending on where a particular civilization existed. Those tools that were made of wood were traditionally more complex than those made of stone; native peoples had a greater degree of freedom and flexibility when using this material as opposed to stone or animal bone. Crude hinges are believed to have appeared in some of these early wooden tools, a component that is still used in today’s society, though it has advanced significantly. In the later parts of the Stone Age, pottery began to emerge. As peoples developed, they began to incorporate natural materials in the creation of storage vessels. Sediments were commonly used for this purpose, with clay being the most common. Further, some more complex tools were developed for agricultural purposes and the domestication of some basic animals. Though the process was slow, the development of tools played a prominent role in the shaping of the Stone Age, as it ushered in an era of significant development of human civilizations. The Paleolithic Age - The Neolithic Age Research Papers examine the period of human prehistory where humans began inventing permanent housing structures. Animal Domestication - With the agricultural revolution at the end of the Neolithic period, human beings began to domesticate animals for both food and labor. Archaeology - Archeology Research Papers choose two archaeological sites, or digs, related to a concept. Paper Masters writes custom research papers on Tools of the Stone Age and discusses how the development of tools lead to the development of human civilizations.